Thank you, everyone, for your kind thoughts and encouragement on the hole-ish disaster during the Great Green Glob blocking. Today I picked up the GGG from Tangle. I will have to stop calling it the Great Green Glob. While still green, and hopefully great, it is no long globish in any sense of the word. But for this post, I’ll call it the GGG just for old time’s sake. So, I picked the GGG up and brought it home to assess the damage. By suturing with sock yarn (I’m not sure, but I think that is STR Rooster Rock), I had stopped the general hemorrhage of dropped stitches. But the repair had left a scar. The GGG still required a bit of plastic surgery to minimize the appearance of the wound. My surgical implements included a bit of left-over yarn, my cool crochet hook/dental pick tool, tapestry needles and pins. The plan was to duplicate stitch (and in some cases actually create knit stitches) with the yarn to hold the whole thing together and make it look at least similar to the non-damaged part of the shawl. The cool thing about blocking lace, apart from the general magicalness of the whole process, is that the yarn stays in the configuration it’s given during blocking. That meant that I could take the sock yarn out and even tease the stitches apart with the dental pick, and not risk more dropped stitches. The rest of the yarn just stayed exactly as it was blocked. Taking a harder look, I think what happened was that I had dropped a stitch when attaching the border. Twice. Oops. 😳 I had two holes that needed to be fixed. I wove the piece of left-over yarn through the stitches to hold everything the way it was supposed to be. There were no stitches missing, just one or two that needed a little help staying where they were. This picture shows one of the fixes completed. The pin is there to hold the tail of the fixer yarn so it doesn’t get misplaced. This stuff is fairly fine, after all. Then I turned my attention to the second hole. This one had stitches actually missing — i.e. a mistake in my knitting — as well as stitches dropped. 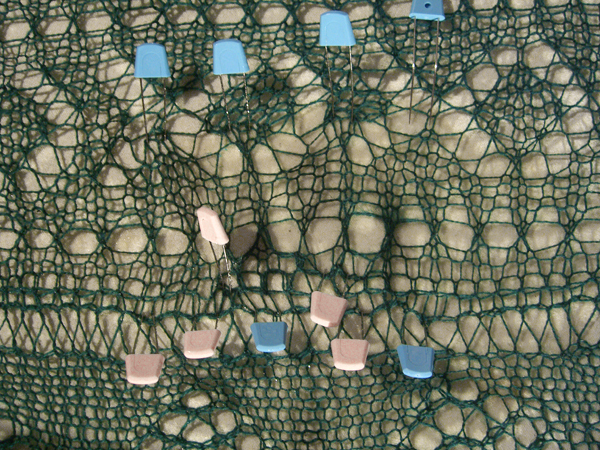 Some of the fix was made by pulling the stitches into shape and holding them there. 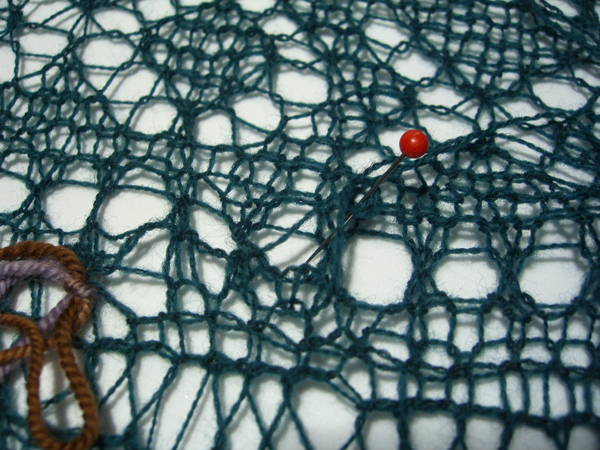 Some of the fix was made by creating new stitches with the fixer yarn. 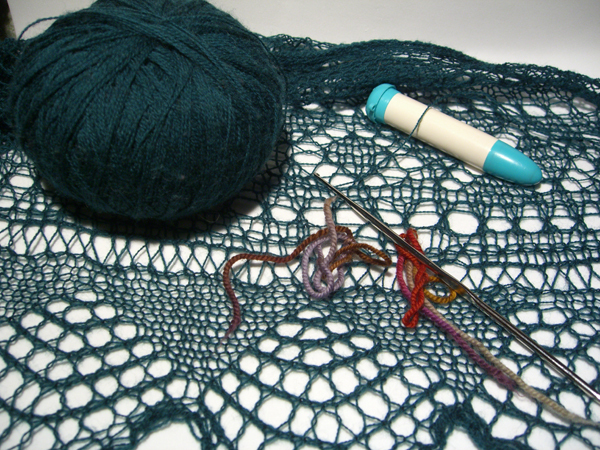 Once all of the fixes where done, I trimmed the tails of the fixer yarn and spit-spliced them to the main shawl. This merino felts if you so much as breath on it, so this was not as drastic as it sounds. Mission nearly accomplished, I pinned out just the fixed area and applied a bit of water and steam with my iron and then left it to dry and block. It’s not perfect. Nothing really could be perfect, gentle reader, except not making the mistake in the first place. But it’s not bad. As it dries, the patch is becoming less and less noticeable. I think that once I take the pins out it’s going to look reasonably OK.